What it is: A must-have hair comb for a painless solution for tangled tresses. 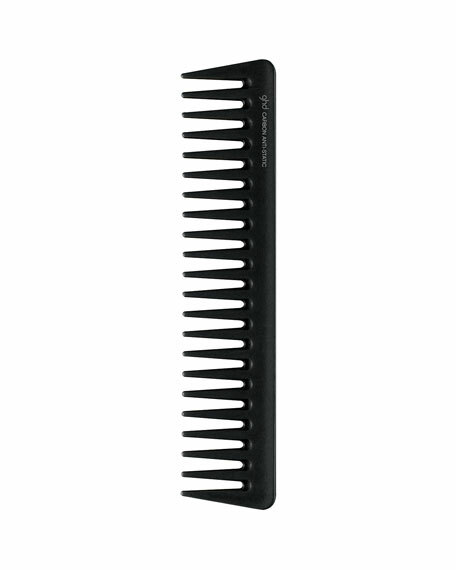 What it does: Best for fast and effective detangling and styling on mid to long hair, this comb features a wide-toothed design and a ceramic body for heat resistance and preventing static. It has a professional design with hand finishing and is great for creating straight and sleek blow-outs while keeping hair in place. What else you need to know: The wide-toothed design allows for delicate detangling on damp hair, which is fragile and more prone to damage. How to use: Work on detangling from the ends to the root. Hold each section as you comb to avoid causing stress to the root area. Style tip: Use your Detangling Comb to distribute conditioner or mousse evenly through damp hair.